You probably have heard about the famous iCloud leaks of celebrity photos, right? And you know the significance of digital data. Maybe you want to resell or donate your Mac, but paranoid about the security of your sensitive data? Or you are concerned about your Mac being stolen and the data could be hijacked? Well, it's natural for us to think like that. The point is: you probably want to know how to permanently delete files on Mac. Because the last thing you'd like to see is that someone "hacks" your Mac and retrieves the private/sensitive data. Yes, files deleted from a storage media such as Mac hard drives can be retrieved, thanks to the so-called data recovery technology -- which is supposed to do good things and recover files deleted accidentally, rather than to serve as an "evil" mean to restore data of someone else. The question is: is it still the case as of 2018? I mean, most new Apple Macs are now with flash storage (solid state drives) or Fusion Drives for some iMac models, rather than traditional spinning hard disk drives (HDDs). Do you still have to secure delete your Mac data? That's what we'll cover in this article, showing you how to securely delete files on macOS depending on whether your computer is with a traditional HDD or a speedy SSD. Why do Macs with Flash Storage (SSD) Matter? Simply put, fewer efforts are needed to completely remove files if your Mac is with an SSD. This is mainly because the way how a solid-state drive (SSD) works is different from that a hard disk drive (HDD) does, especially when your Macintosh internal drive uses TRIM command. To avoid Mac slowdowns that traditional spinning hard drives often cause, Trim allows macOS to immediately wipe blocks of data that are no longer considered in use — once you delete the files either by emptying Trash or using similar tricks to get rid of the files such as Command + Del or Command + Opt + Backspace. This TRIM technique speeds up data access process and has a side-benefit of making it impossible for anyone to recover the files erased from an SSD-based Mac. Macs with HDDs, on the other hand, are entirely different. Even if you've emptied Trash bin or used other similar methods to get rid of files, it's still quite possible to recover the files using a Mac data recovery software as long as the items are not fully overwritten. You can also learn more from this article we wrote earlier. How to Check if Your Mac is with SSD or HDD? Depending on the type of Mac computers you are using, MacBook Pro/Air, iMac, or Mac Pro/Mini, it may be equipped with a different kind of storage media. For example, in 2018 most new MacBooks are now shipped with an SSD, while certain iMac models still have the options for you to choose between Fusion Drive and Flash Storage. Also Read: best internal SSD upgrades for MacBook and best portable SSD drives to get. To find that out, simply click on the Apple logo on the top left of Mac screen, then go to About This Mac > Storage, right under the disk icon and you'll see a line like this (in red). It tells clearly whether your Mac with a Solid State SATA Drive or a spinning hard drive. If your Mac is with an SSD and you want to check whether it's TRIM enabled, see this article for how. 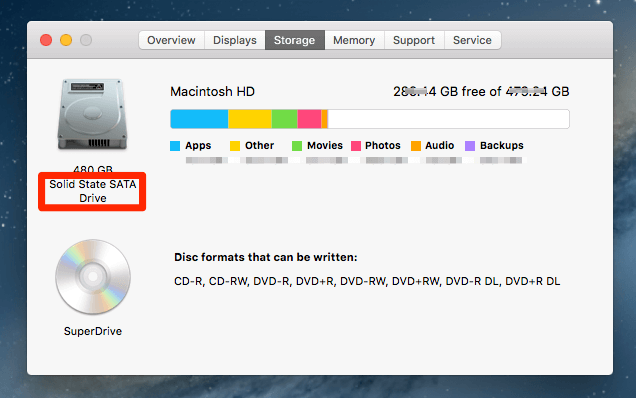 How to Permanently Delete Files on an SSD-based Mac? It's quite simple. Just drag the files to Trash or right click and select Move to Trash, then open the Trash app and select Delete Permanently or Empty Trash. That's it! However, if you are still paranoid and want to make sure the deleted files are 100% unrecoverable, you can use CleanMyMac 3. Download CleanMyMac and install the app on your Mac. 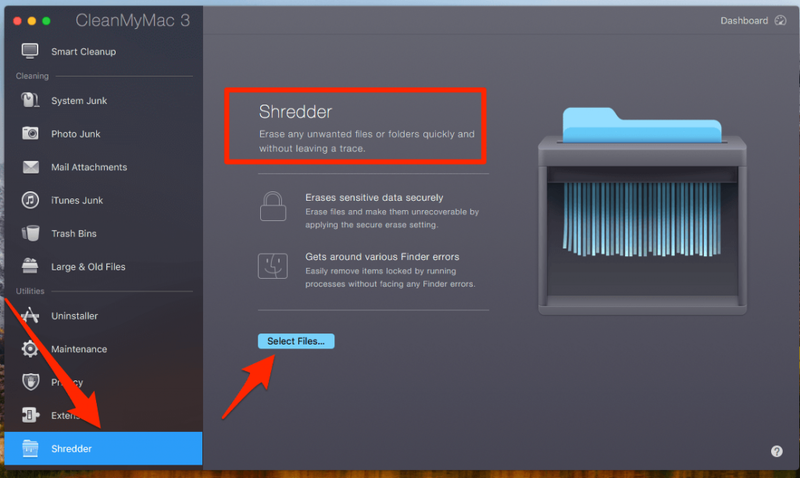 Launch it, click on the "Shredder" feature located on the bottom left of the app. Select the files or folders you'd like to wipe, and proceed. How to Permanently Delete Files on an HDD-based Mac? 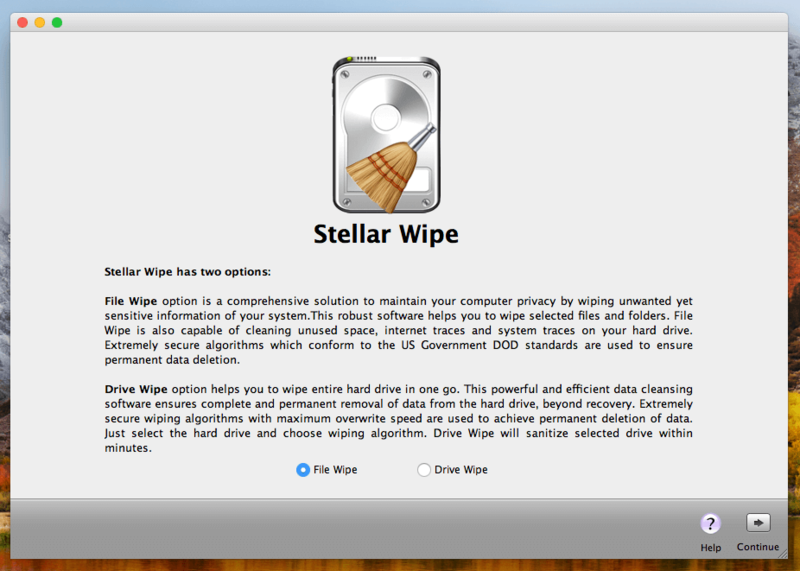 Stellar Wipe Mac - a professional data wipe utility that you can use to erase both individual files/folders, and the entire Mac hard drive. The step-by-step instructions are quite straightforward thanks to Stellar Wipe's well-designed interfaces, thus we're not going to diver into the details here. Permanently removing files from a Mac seems very easy to do, though extra efforts may be needed depending on the type of storage media your Mac is using — i.e. HDD or SSD. Hope this article has cleared any confusions you might have. One more thing - as a reminder, before you proceed make sure you know what you are doing and only delete those files you absolutely want to vanish, and don't forget to back up those important data. I can still recover files from my ssd? then it not deleting it when i just throw the files in the basket? Chances to recover files deleted from an SSD is slim, if not at all.